Officers at a county police agency in Virginia say they attempted to initiate a traffic stop of a motorcycle rider on two different occasions, but both times, the driver evaded. 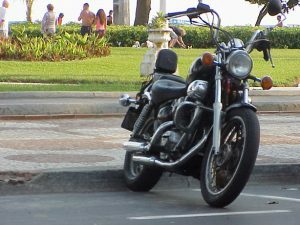 Police were able to learn from those encounters that the motorcycle in question was stolen. A suspect was identified, based on Facebook photos the suspect had posted of the motorcycle in question, which was parked at suspect’s girlfriend’s home. An officer went to that location, where a motorcycle was spotted – covered by a tarp – in the driveway. The officer – who did not have a warrant and was not invited onto the property – removed the tarp. Based on the information he gathered, he identified the bike as stolen and arrested the suspect – who claimed he purchased the motorcycle without a title. He was charged with receiving stolen property. Defendant sought to suppress this evidence, arguing the officer had no right to initiate a search of a vehicle on private property. The Virginia Supreme Court disagreed, finding the search was allowable because the officer did have probable cause and thus didn’t need a warrant, per the automobile exception to the Fourth Amendment. The U.S. Supreme Court reversed. The majority opinion, written by Justice Sonia Sotomayor, found the auto exception wasn’t applicable here because the officer in question intruded upon the home’s curtilage (which is the area adjacent to the house where activity of home life extends). The automobile exception, justices wrote, is founded upon the principle that motor vehicles are readily mobile and already extensively regulated. There is a balance, the majority wrote, between the intrusion on someone’s Fourth Amendment protection against unreasonable search and seizure, and the government’s interest in expediently searching a vehicle. However, the exception doesn’t account for the privacy interest one has in and around their home. So as our Fort Lauderdale criminal defense attorneys can explain, while a motorcycle IS a vehicle and while the automobile exception does extend to motorcycles that are on the road (particularly when evidence is in plain sight), it does not extend to the area around one’s home. Justice Samuel Alito Jr., the sole dissenter, argued that the police officer’s action in this case was “entirely reasonable,” while it was the court’s ruling that was not.